Since 1990, the private meteorological firm of Henz Meteorological Services (HMS) has been responsible for the early flood predictions and notifications provided to local governments by the District's Flash Flood Prediction Program (F2P2). This program provides forecast services from mid-April through mid-September and has been in operation for the past 22 consecutive years. John Henz, President of HMS, decided to close business operations after accepting a staff position with HDR Engineering in Denver. HMS Meteorologist Bryan Rappolt also accepted a position with HDR. John hopes to reach a much wider local flood warning market through this new affiliation and intends to pursue future work with the District. John and his business associates have been providing the F2P2 meteorological support services since its inception in 1979. The District and the Boulder/Boulder County Office of Emergency Management have signed an agreement to study the effectiveness of the local flood warning program for the City of Boulder and Boulder County. This program was created in 1979 based on behavioral science research and recommendations by the University of Colorado following the 1976 Big Thompson Canyon flash flood disaster. The study approach will be to make use of the latest available findings and research from more recent Colorado and U.S. flood disasters, like the 1997 Spring Creek flash flood in Fort Collins, to estimate the effectiveness of the existing program and recommend ways to improve it. Dr. Eve Gruntfest with the University of Colorado at Colorado Springs will be the lead researcher. Eve was involved with the original research conducted by CU in 1977. Like the rest of the world, the District's ALERT system survived significant system changes driven by Y2K. Modern computer equipment and new software replaced the aging/obsolete 486 base stations and other antiquated components, which had performed well for many years. This upgrade included a new operating system (OS), initiating another learning-curve process. While not totally bug-free, the new systems performed well during the 2000 flood season. The software supplier (HydroLynx Systems of Rancho Cordova, CA) and a local engineering consultant (Bruce Rindahl with Brown and Caldwell, formerly with HDR Engineering) provided valuable technical support. The new OS also provided the gateway to popular Internet TCP/IP communications making the dedicated web server http://alert.udfcd.org the easiest way to obtain rainfall measurements, stream/reservoir water levels and weather data from the District ALERT system. Prior to this, the primary means of acquiring ALERT data was by direct modem connections (authorized users only) or by requesting hard copy products from the District. While dial-up access is still reliably used, the Internet solution has clearly become the method of choice for most users, as expected. The District currently supports 7 ALERT base stations. The "ALERT Web Server" resides at the District office with the primary 2-node LAN base and STORM Watch platforms. The LAN base is designed for automatic emergency failover operations should either PC malfunction. A mouse (Zapus hudsonius preblei, a.k.a. Preble's Meadow Jumping Mouse) has delayed completion of the Douglas County ALERT expansion project that was started in 1997. With 5 gaging stations fully operational, the proposed sixth station (East Plum Creek) has become the most costly. Installation is pending resolution of this issue and the proposed site (approximately 5 miles south of Castle Rock) is currently under review by the U.S. Fish and Wildlife Service. For those interested in learning more about our mouse friend --- read the article by Mark Hunter. ALERT system expansion anticipated for 2001 includes southwest Denver, eastern Aurora and Third Creek downstream of DIA. Preliminary investigations have been completed for these projects and funding arrangements are progressing. ALERT mesonet (weather stations) growth and utility is continuing with additional stations expected for 2001. The newest weather station in this 15-station network was installed this past June at the State Patrol's radio tower facility on Squaw Mountain south of Idaho Springs. This platform hosts a sonic wind sensor, a tipping bucket rain gauge and measures temperature and relative humidity every 15 minutes. This high elevation site (11,400') has already proven itself a valuable storm-forecasting tool for meteorologists by providing the means to continuously monitor a 6,500-foot vertical profile of wind, temperature and moisture. The weather station for the Urban Farm at Stapleton will be the next to come on-line sometime this winter. Weather stations are also anticipated for sites near Aurora Reservoir, Marston Lake in SW Denver and DIAD Incorporated in Longmont. DIAD provided maintenance services for the District and Boulder County ALERT systems during 2000 and authored the STORM Watch software package mentioned previously. The 2000 flood season --- a year characterized by record high temperatures, destructive forest fires and one flood-related death --- may be the most uneventful overall since the F2P2 began operating in 1979. In spite of extended periods of dryness and heat, District flooding made headline news for few events this past year with August 17 being the most tragic. On this day, a 37-year-old Denver fire fighter and father of three, Robert Crump, lost his life after rescuing a woman from swirling waters in northeast Denver. 2000 Peak Flows. The table lists some of the more notable peaks measured by the ALERT system. 22:02 Westerly Creek at Montview Blvd. Snowplows were needed in along C-470 near Highlands Ranch for this first flash flood threat day of the 2000 flood season. The media reported grape-sized hail up to 6" deep and rainfall totals of 1.7" in Brighton, Aurora and Parker. The ALERT gage at the Highlands Ranch Water Treatment Plant measured 1.93" after the hail had melted. The maximum precipitation amount in the network (2.13") was recorded near Smoky Hill and Gun Club Roads in SE Aurora. No significant stream flooding was reported. Storms plagued much on NE Colorado on this day with 23 tornadoes being reported, but no serious injuries. Messages calling for street/nuisance flooding potential were in effect between 10:30 a.m. and 3:00 p.m.
After nearly two months with only five days of limited flood potential, the widespread rains of July 16 attempted to recover the regions moisture deficit. It was during this extended dry period that two major Colorado wildfires caused record damage in Jefferson and Larimer Counties ("Hi Meadow" and "Bobcat" Fires). The July 16 storms produced rainfall rate alarms at 16 gaging stations in the ALERT network. Rainfall amounts exceeded 0.5" throughout much of the system while peak totals approached 3" at a number of locations. The higher measured amounts occurred in the Lena Gulch and Ralston Creek drainage basins in Arvada, Lakewood, Wheat Ridge and unincorporated Jefferson County. The Ralston Reservoir gage recorded the highest rainfall total (3.70"). The days rain resulted in at least 8 annual peak stream gage measurements (see table). The Havana Park detention basin gage, located in Auroras Westerly Creek basin near 11th and Havana, broke its 13-year high water record at 12 minutes past midnight. The NWS issued a flash flood watch for the Front Range foothills from noon until midnight. With rain accumulations approaching critical thresholds at some locations, a flash flood warning was issued for NE Jefferson County at 8:24 p.m. No major flood problems were reported. The District escaped the flood threat on this day but areas in extreme northwest Elbert County were less fortunate. Flooding in the upper Box Elder Creek basin washed out County Road 13 near Elizabeth and caused other problems in town. By the time the floodwaters reached the District/Arapahoe County border, the peak had attenuated and no problems were reported. A flash flood watch had been in effect for the entire District from noon to 10 p.m. This day will be remembered for the sad loss of Denver fire fighter, Bob Crump, who died in the line of duty after rescuing a woman from floodwaters in the vicinity of E. 49th Ave. and Colorado Blvd. The map shows rainfall totals for a 5-hour period ending at 8 p.m. The 2.64" amount shown for Commerce City is closest to the location where Bob Crump lost his life after being pulled into a submerged open 36" storm sewer. The storm at this location was estimated to be a 75-year event. The flooding that was realized this day was somewhat unexpected. Morning analysis indicated minimum flood potential, but weather conditions changed substantially by mid-afternoon. At 3:32 p.m., HMS meteorologist Bryan Rappolt issued a message for Arapahoe County calling for strong thunderstorms capable of producing 0.5" to 1.5" in 15-30 minutes with hail as large as 0.5" possible. The message was valid from 3:45 to 8:00 p.m. and the risk to life and property was considered low. Subsequent messages followed, but this was the first notice of any potential flood threat. Within the next 10 to 15 minutes, heavy rainfall was occurring over northern Douglas County and the Littleton area. By 4 p.m., the NWS had issued an urban and small stream flood advisory for this storm and at 4:37 p.m. the advisory was upgraded to a flash flood warning for a large portion of the Denver metropolitan area. Slaughterhouse Gulch through the City of Littleton was one area hit hard by this storm (see 2.36" amount on map). In 1998, the District's Construction Program completed storm drainage improvements to the upper basin, thus allowing new detention facilities to begin providing some relief to properties downstream. This multi-phase project was initiated in 1985 with the City of Littleton and Arapahoe County. 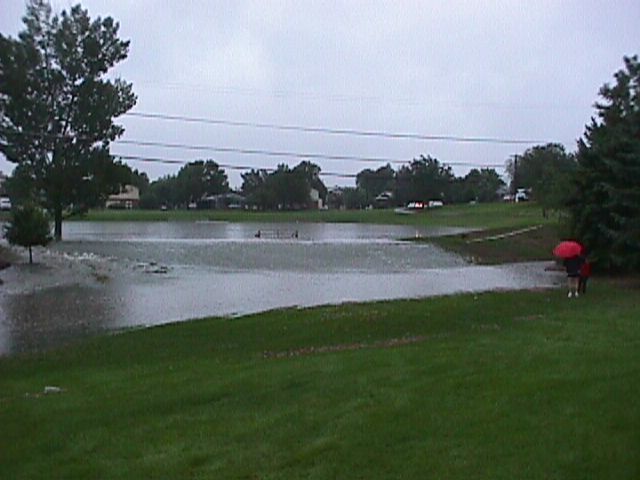 The Grant Street detention basin near Orchard and Broadway performed well during this event, filling to a record depth of 8.1 feet (see figure). Damages were certainly prevented at this location. Another detention basin further downstream at Powers Park overflowed, resulting in some significant property damage to a duplex in the floodplain along West Berry Drive. The Powers Park facility was designed to handle up to a 10-year storm, which was exceeded on August 17. The peak flow table shows six other ALERT streams gages, in addition to the Slaughterhouse gage, that measured annual peaks from this storm. Grant Street Detention Basin on upper Slaughterhouse Gulch. Powers Park detention basin overflowing its spillway. looking toward spillway from upstream end. Between 7:30 and 9:00 p.m., a large thunderstorm produced heavy rainfall over Commerce City, Thornton and western Adams County causing some localized flooding. The storm dumped up to 2" of rain in 20 to 40 minutes and was accompanied by frequent cloud-to-ground lightning. The Niver Creek detention basin at 88th and I-25 measured its annual peak on this day. This was the last significant rain event of the 2000 flood season. The 2000 flood season marks the year with the fewest days with messages issued (23, average is 35, record high 52 in 1996), the fewest number of verified message days (20), and the lowest number of message days for June and July (1 and 6 respectively). ALERT data is currently available from 144 gaging stations (126 rain gages, 64 water level sensors and 15 weather stations).